Home > Moving Guides > Types of Moves > Small Moves > How Much Does a Small Move Cost? 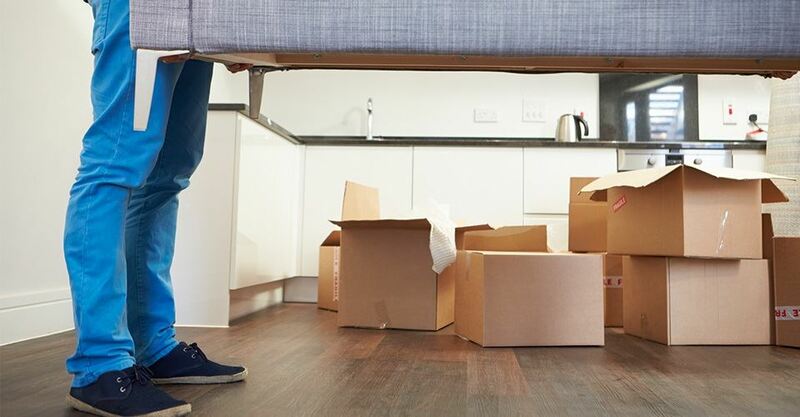 If you are moving a small amount of boxes and furniture, you may be wondering if it's cheaper or more convenient to move your things yourself or hire a moving company. You may also be wondering if movers would even bother to handle a shipment as small as yours. In the moving industry, most commercial moving companies require a minimum of 2,000 pounds worth of goods to handle your shipment -- anything less than that is considered a small move. For moves such as these, you would contact small movers. Apartment and dorm moves are ideal for small movers, because they will have plenty of experience handling them. Navigating the staircases, parking constraints and elevators involved in is second nature to them. Most standard moving companies will have a minimum charge for all shipments. Even if your total weight is under 2,000 pounds (about a room-and-a-half's worth of stuff), you will still pay as though it isn't. Small movers specialize in these kinds of shipments, and using one will save you money. The cost of your small move will vary depending on the weight of your shipment, the distance you are moving and the company you choose. The following table will provide you with some estimates for the costs of moving different-sized shipments various distances. If you are moving furniture, find out if there are any steps that you can take to prepare your goods before moving day to lower your costs. A studio, a lightly-furnished apartment or a dorm room qualifies as a small move. Small movers will also move a few pieces of furniture to your new location, as well as specialty items such as a drum sets, hot tubs or gun safes. If you have a load too large for parcel shipment, but too small for a standard moving company, call small movers. What services they provide are up to your needs and budget. How long will a small move take? The time frame for a small move is often not set in stone. Since small moving companies transport minimal shipments, they often consolidate your belongings with those of other customers in a warehouse until they have another scheduled move in your area. This way, they can maximize profits by handling multiple moves and making the most out of their trailer space. Small movers will rarely supply you with a concrete date of expected delivery. If you can be flexible about when you receive your shipment, you shouldn't have a problem hiring small movers. Is it worth it to hire small movers, or can you handle it yourself? If you prefer to have access to your belongings right away, you may consider handling your small move yourself. Because rental truck companies charge about per mile traveled plus a flat fee for the size truck you require, this could be more or less economical depending on the distance. You could also opt to hire a "You Load, We Drive" service. These companies will deliver a portable storage unit to your door that you can load at your leisure. When you are ready, they will pick up the trailer and deliver it to the front door of your new home. With some companies, you only have to pay for the space that you use; fuel costs are often included in the price. How busy are you? If you work full-time or have other commitments, you may not have time in your schedule. If you are moving across country, you are looking at up to a week just driving the truck! Do you have access to a babysitter to keep your kids busy while you tend to the tasks? It's easy for kids to get underfoot when you're concentrating on other things. You risk injury to them and yourself. Do you have a lot of strong and helpful friends around to lend a hand? Aside from the physical labor associated with your move, you will have other things to take care of -- such as address changes, utility hook-ups and other pre-move planning. Attempting to handle everything on your own can be overwhelming. How far are you moving? A long distance move will commitment and work. Even if you think you can handle all of the packing and loading on your own, driving a cumbersome moving truck an entire day or more can be difficult, stressful and exhausting. How big is your budget? A DIY move can sometimes be just as costly as hiring small movers. You'll pay a flat fee for the truck but also for every mile driven and all gas used. When hiring small movers, you'll usually be charged by weight and distance (long distance moves) or by the hour (local moves). How heavy are your belongings? Small movers can easily carry and load your bulky furniture items, as well as properly wrap them for protection. Furniture can easily become damaged during a move -- especially if you are struggling to carry and move it. Are you comfortable driving a moving truck? Maneuvering a cumbersome rental truck can be difficult, especially if you have little to no experience. You will also need to remember weight restrictions and overhead clearance when planning your route. Parking the truck can also be a struggle if you are not comfortable behind a large vehicle's wheel. How is pricing determined? Small movers typically charge based on the weight of your goods or the cubic feet they require plus the distance of your move and the time it takes to get there. Make sure to receive an in-home estimate from any small movers you are considering for hire before booking your move. A phone estimate or online quote will not be as accurate as having a surveyor visit your home to assess your belongings. Do you have any restrictions? Since they are handling a smaller load, small movers may accept moves that are not worth their time. Ask about restrictions or minimum weight, distance or time requirements. What services do you offer? Not every small mover offers the same services. Some do not pack, and others don't move instruments. When you are receiving your on-site estimate, discuss your needs with the company representative. Do you handle specialty items? Many small movers have a very low weight minimum and will often transport just one item. They are usually trained to handle, wrap and transport difficult, cumbersome specialty items like pool tables and grandfather clocks. If you possess any items that require special service, make sure the company can accommodate the request before enlisting their services. Do you offer packing services? The most dreaded aspect of moving is undoubtedly the packing -- which is why many customers shell out extra cash to avoid it. If you are interested in this service, ask your small movers if it is provided and what it will cost. Some tasks and necessary materials may be included in your move price (such as furniture wrapping), and others may incur extra fees (custom crating). Do you offer furniture disassembly/reassembly? If you are not handy with tools, you may be unable to disassemble or reassemble your own entertainment center, bookcase or glass-topped dining table. Do you need your bed frame taken apart and reassembled at your new home? Your small movers may offer this service. Do you offer appliance installation? Need some assistance disconnecting your refrigerator? Hooking up your washer and dryer? Ask about the company's experience with these tasks. Do you provide in-home pickup service? Small movers will often offer both in-home and curbside pick up. If you need to save a buck and have the help of some strong friends, curbside may suit your needs. If not, you will require in-home pick-up. Are there any extra fees? Small moving companies may tack on additional charges for things like stair carries, packing materials, furniture wrapping, furniture disassembly and reassembly, moving specialty items and in-house pick-up (rather than curbside). Be as detailed about your needs as possible. Include the services you desire and the price you expect to pay for them. What are your licensing credentials? When considering any moving service, you want to make they have the proper licensing credentials for the move. Any interstate moving company is required by the FMCSA to be registered with a USDOT number. This number allows the regulatory agency to monitor the moving company for safety, ethical business practices and proper conduct. What are my insurance options? You should always have your shipment insured in case of damage or lost items. The standard liability coverage moving companies are legally required to offer is known as Replacement Value Protection, but many moving companies will offer Full Value Protection, which covers the full amount of replacing or repairing a broken or misplaced item. What is your claims process? Ask your movers the standard process for filing a claim should anything become lost or sustain damage. You are legally required to file a written claim with the company to receive compensation. It is against the law for all interstate and most intrastate carriers to alter the charges indicated on your bill of lading without a formerly written claim. Ask the company if they have the form online and if not, where you can obtain one. You must submit your claim within nine months of the delivery of your goods by the movers via certified mail. Rate this guide How Much Does a Small Move Cost?